The gorgeous Alesha Dixon is the May 2013 cover girl for Cosmopolitan UK. You won’t want to miss this new issue out now. Alesha shares her tips for success, through to 497 summer fashion buys. Grab your copy now. 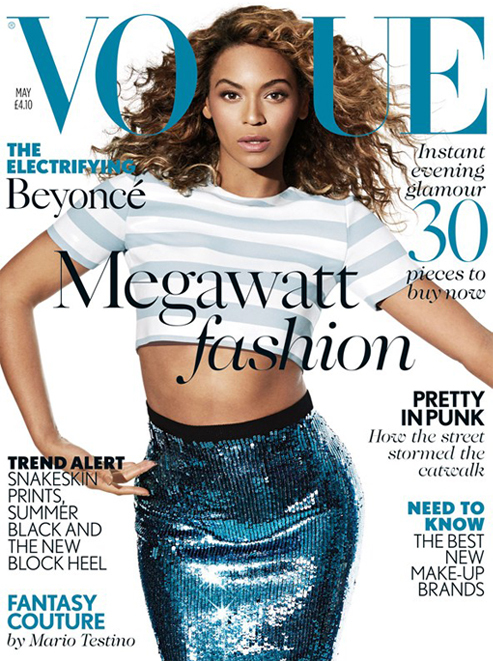 Our very own Mrs Carter is on the cover of Vogue UK May 2013 Issue looking amazing. What do you think of this cover? I cannot wait to get my hands on this issue. This issue is out now, will you be grabbing a copy? It is Kimora Lee Simmons vs Kristen Stewart in this Herve Leger dress. Who wore it better? Let’s hear it.